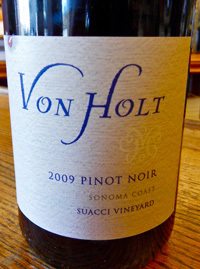 2009 Von Holt, Pinot Noir “Suacci Vineyard” Sonoma Coast. This is a small producer to watch, Von Holt does small lots of Pinot Noir and Chardonnay from top sites following the lead of Siduri, Loring, Kosta Browne and the likes. The wines are made in the same winery as Roar and AP Vin, not bad company to keep and the latest set are without question stunning wines. The 2009 Suacci is beautifully perfumed, brightly fruited and wonderfully balanced with violets, earth, spices and loaded with cherry and blueberry fruit while refreshing acidity and a silky texture show pure class and vigor. A long plumy finish with a nice touch of toasty oak lingers perfectly.